This week's What's in your Handbag series post is coming up today and Laura from Make Life Lovely is sharing her bag with all of you. Hi guys! I'm Laura and I blog at Make Life Lovely, where I share tons of DIY projects, crafts, parties, holiday ideas, and more! I'd love to have you visit! 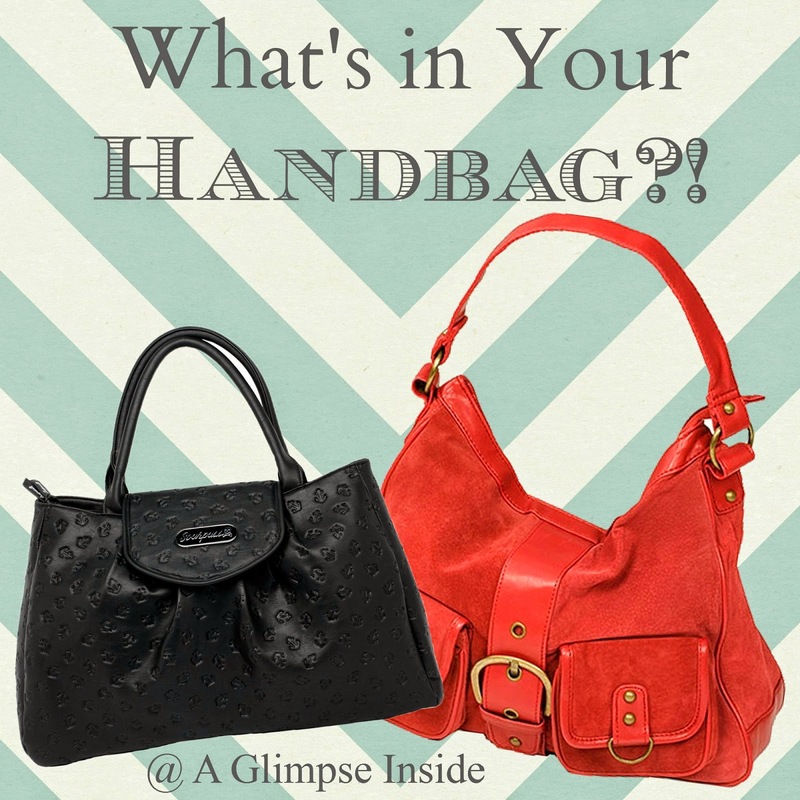 I believe you can learn a lot about a woman by what's in her purse, and I'm excited to share my handbag contents with you today! Everything you see is the below photo was all that was in my purse. Only one thing is missing…. receipts. Lots and lots of receipts! 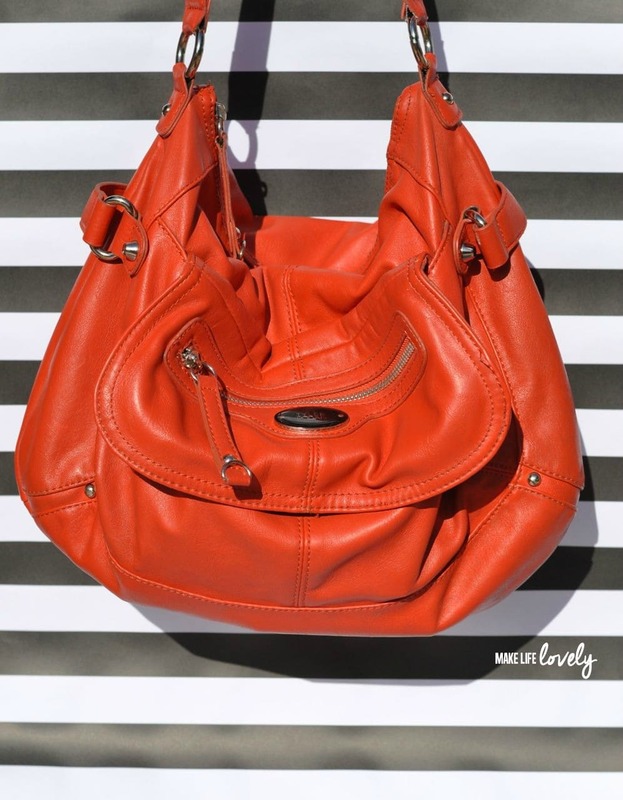 I keep my purse pretty clean minus those pesky receipts that seem to multiply in the dark confines of my purse! Please tell me you have this problem too? Okay, let's start in the top right corner and go clockwise. Lip gloss // You will never find less than 2 or 3 tubes of lip gloss in my purse at all times. I almost always have something on my lips because I like the way my lips look glossy and shiny, and because they get chapped easily if I don;t have anything on them. My favorite lip glosses are all by MAC… okay, all my favorite makeup is from MAC! Shown are two MAC lip glosses and one Revlon lip gloss. Nail file // My nails like to break, so it's nice to have a nail file in my purse to smooth out those uneven and sharp edges when they do! Plus, it can also double as sandpaper! Perfume // I usually carry one or two little bottles of perfume in my purse. They're nice to have just in case! Pen & Glue // Always! You never know when you'll need to glue something. Sucker // This sucker has been sitting in my purse since getting home from SNAP Conference, just waiting to be devoured. My kids have all begged for it, but I'm holding on to it for when I really need something sweet! World Market gift card // One of my favorite stores where I shop weekly! Monopoly game piece // I have been finding those darn Monopoly pieces from Albertsons all over the place now that the promotion is over with! Tape Measure // Another thing I don't like to leave home without. I am always needing to know different measurements for all of the projects I'm working on, so this totally comes in handy. Benihana wet wipes // Last team we were at Benihanas the lady gave me a handful of these for later for my two-year old, and said I would need them…. Hmmm, how did she know? Sunglasses // Another essential, especially in the warm San Diego sun that is always shining! Wallet // This wallet is huge but I wouldn't have it any other way. I must have something large to contain my crazy receipt collection! 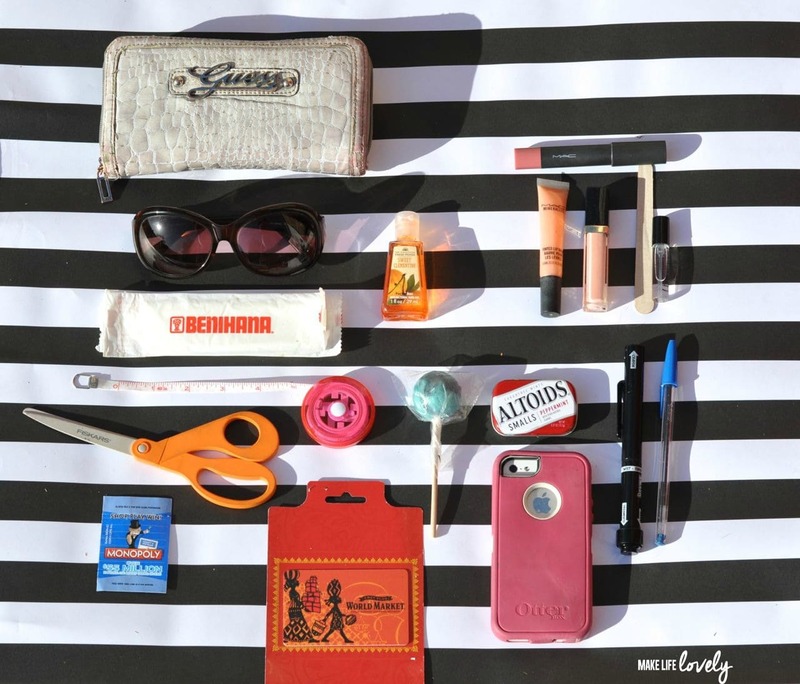 Now that I've shared the contents of my handbag with you, we should totally be friends! I'd love to keep in touch. You can find me on my blog Make Life Lovely, and on Facebook, Pinterest, and Instagram.